Starting from Zinal, we ascend an easy snowshoe trail to an ice cave in the mouth of the Zinal glacier. We can easily explore the entrance to the cave. Some years, we have the option to go deeper inside with an ice axe, crampons & headlamp, but every year it's different. •	An email address you can read on the weekend. •	Your mobile phone number. •	Have you ever used snowshoes? •	Do you plan to bring crampons & piolet? •	Are you an Oxygène 74 Member? To bring: snowshoes, gaiters, hiking boots, warm clothing, hat, picnic, water, sweater, sunscreen, sunglasses, collapsible ski poles. 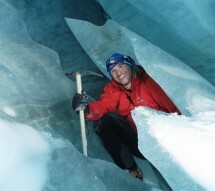 If you would like to try to go deeply into the cave (optional): ice axe, crampons & headlamp. I can rent equipment at 10 CHF for each item. Price: €5 fee for non-members of Oxygène 74. In case of bad weather: If the weather forecast is bad, we will cancel. Also, if the avalanche danger is high we will cancel. I'll send an email the afternoon before the hike with my decision.